For a Bryn Mawr alumnae reunion, Helen Hazard Bacon submitted a short biography and she commented that “when forty years are compressed into one page most of the really important things are necessarily omitted or between the lines.” Such is the challenge in trying to describe the Helen H. Bacon Papers now processed at the Barnard College Archives. Pres. 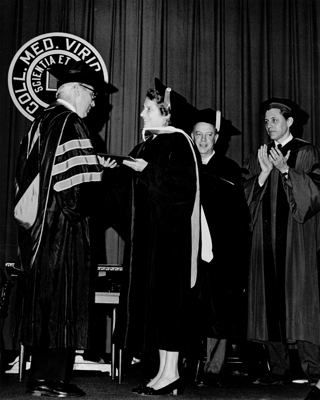 James I. Armstrong awards Helen H. Bacon with honorary degree, Middlebury College, VT, June 1, 1970. Courtesy of the Barnard College Archives, Helen H. Bacon Papers. The collection primarily consists of the Prof. Bacon’s research and class papers as a member of the Greek and Latin Department at Barnard College and Columbia University. Her papers document her progressive scholarly work and the wide range of classes she taught, and also offer a glimpse into the life and career of a remarkable member of the Barnard faculty. In 1942, after pursuing some graduate studies, Helen Bacon joined the U.S. Naval Reserve as a Women Accepted for Volunteer Emergency Service (WAVES). Along with other linguists and classicists, including her own Bryn Mawr professor Richmond Lattimore, she worked in the Navy’s Communications Annex in Washington, D.C. In her papers, from a lecture presented to the Navy Reserves in 1993, we learn that “Bake”, as she was nicknamed then, was actually a cryptanalysist decoding Japanese radio communications. 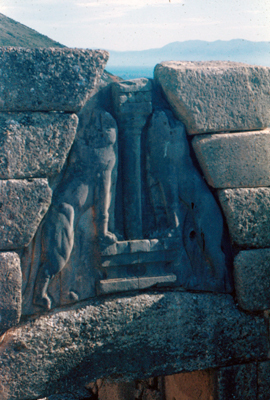 The Lion Gate at Mycenae, Greece, March 12, 1951. Photograph by Helen H. Bacon (presumed). Courtesy of the Barnard College Archives, Helen H. Bacon Papers. After the Navy, she returned to graduate school at Bryn Mawr. In her papers, we find her slides from a trip to Greece while she was teaching at the Woman’s College of Greensboro, N.C. She returned the following year on a Fullbright fellowship and studied at the American Academy of Classical Studies in Athens. In her richly detailed travel journals, she records her awe at the walls in Mycenae, “really Cyclopean – gigantic blocks of conglomerate, held together by gravity only.” She also captures conversations with her fellow students and locals over ouzo, mostly in French, as they share their desire for peace and their distrust of generals, Eisenhower and Papagos. Prof. Bacon’s papers show the life of the scholar: the bibliographies, research notes, first drafts and revised editions, all in paper. She was self-admittedly not a great typist so her copious handwritten notes show us how each idea takes shape. In the correspondence, we can read her colleagues’ feedback on a draft, a letter of appreciation from a fellow scholar who found her work, and even a journal editor’s rejection letter. In her class papers, we can almost follow each lecture as she kept her notes, syllabi, reading lists and even exams. 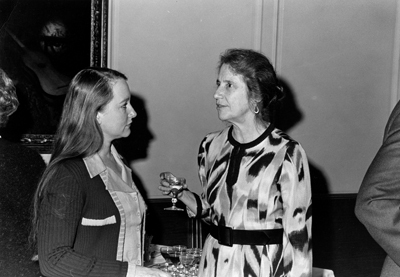 Helen H. Bacon and unidentified guest at Library of Congress conference honoring the work of Robert Frost, March 26, 1974, Washington, D.C. Photography by Library of Congress, courtesy of the Barnard College Archives, Helen H. Bacon Papers. As the daughter of a poet, Prof. Bacon brought a literary approach to her readings of the classical texts. She also used her classical background to write on the works of Robert Frost. Over the summers, she taught Classics in translation at the Bread Loaf School of English at Middlebury College, for which she was awarded an honorary doctorate in 1970. With Pulitzer prize poet Anthony Hecht, she co-authored a translation of Aeschylus’ Seven Against Thebes, which was nominated for a National Book Award in 1973. Prof. Bacon described two kinds of experiences for classicists visiting Greece for the first time: “Either he says ‘How the world of Sophocles and Plato has degenerated’ … or else, with a conviction beyond rational explanation, he says to himself ‘I have been here before’.” “I belong to the second group,” she states, “a group which to those who need prose explanations for things will always seem sentimental, emotionally uncontrolled in permitting romantic feelings to distort their intellectual objectivity.” The Helen H. Bacon papers show that enthusiasm for her studies and her life. 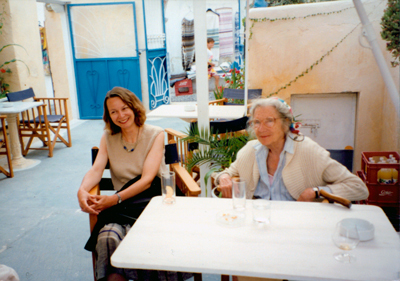 Marion Cowan and Helen H. Bacon (left to right) sitting in a tavern in Santorini, Greece, 1990. Photograph courtesy Marion Cowan and the Barnard College Archives, Helen Bacon papers.